Gum arabic, also known as acacia gum, arabic gum, gum acacia, acacia, Senegal gum and Indian gum, and by other names, is a natural gum consisting of the hardened sap of various species of the acacia tree. Gum arabic is collected from acacia species, predominantly Acacia senegal and Vachellia (Acacia) seyal. The term "gum arabic" does not indicate a particular botanical source. 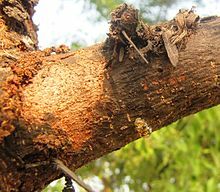 In a few cases so‐called "gum arabic" may not even have been collected from Acacia species, but may originate from Combretum, Albizia or some other genus. The gum is harvested commercially from wild trees, mostly in Sudan (80%) and throughout the Sahel, from Senegal to Somalia—though it is historically cultivated in Arabia and West Asia. Gum arabic is a complex mixture of glycoproteins and polysaccharides predominantly consisting of arabinose and galactose. It is soluble in water, edible, and used primarily in the food industry as a stabilizer, with EU E number E414. Gum arabic is a key ingredient in traditional lithography and is used in printing, paint production, glue, cosmetics and various industrial applications, including viscosity control in inks and in textile industries, though less expensive materials compete with it for many of these roles. While gum arabic is now produced throughout the African Sahel, it is still harvested and used in the Middle East. Gum arabic was defined by the 31st Codex Committee for Food Additives, held at The Hague from 19–23 March 1999, as the dried exudate from the trunks and branches of Acacia senegal or Vachellia (Acacia) seyal in the family Fabaceae (Leguminosae). :4 A 2017 safety re-evaluation by the Panel on Food Additives and Nutrient Sources of the European Food Safety Authority (EFSA) said that the term "gum arabic" does not indicate a particular botanical source; in a few cases so‐called "gum arabic" may not even have been collected from Acacia species. Gum arabic's mixture of polysaccharides and glycoproteins gives it the properties of a glue and binder that is edible by humans. Other substances have replaced it where toxicity is not an issue, and as the proportions of the various chemicals in gum arabic vary widely and make it unpredictable. Still, it remains an important ingredient in soft drink syrup and "hard" gummy candies such as gumdrops, marshmallows, and M&M's chocolate candies. For artists, it is the traditional binder in watercolor paint, in photography for gum printing, and it is used as a binder in pyrotechnic compositions. Pharmaceutical drugs and cosmetics also use the gum as a binder, emulsifying agent, and a suspending or viscosity increasing agent. Wine makers have used gum arabic as a wine fining agent. It is an important ingredient in shoe polish, and can be used in making homemade incense cones. It is also used as a lickable adhesive, for example on postage stamps, envelopes, and cigarette papers. Lithographic printers employ it to keep the non-image areas of the plate receptive to water. This treatment also helps to stop oxidation of aluminium printing plates in the interval between processing of the plate and its use on a printing press. Gum arabic is used in the food industry as a stabilizer, emulsifier and thickening agent in icing, fillings, soft candy, chewing gum and other confectionery and to bind the sweeteners and flavorings in soft drinks. A solution of sugar and gum arabic in water, gomme syrup, is sometimes used in cocktails to prevent the sugar from crystallizing and provide a smooth texture. Gum arabic is a soluble dietary fibre, a complex polysaccharide, primarily indigestible to both humans and animals. It is considered[who?] non-toxic and safe for human consumption. There is indication of harmless flatulence in some people taking large doses of 30g or more per day. It is not degraded in the intestine, but fermented in the colon under the influence of microorganisms—it is a prebiotic (as distinct from a probiotic). There is no regulatory or scientific consensus about its caloric value; an upper limit of 2 kcal/g was set for rats, but this is not valid for humans. The US FDA initially set a value of 4 kcal/g for food labelling, but in Europe no value was assigned for soluble dietary fibre. A 1998 review concluded that "based on present scientific knowledge only an arbitrary value can be used for regulatory purposes". In 2008 the FDA sent a letter of no objection in response to an application to reduce the rated caloric value of gum arabic to 1.7 kcal/g. 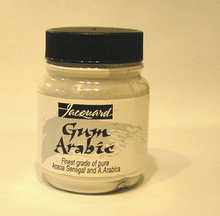 Powdered gum arabic for artists, one part gum arabic is dissolved in four parts distilled water to make a liquid suitable for adding to pigments. Gum arabic is used as a binder for watercolor painting because it dissolves easily in water. Pigment of any color is suspended within the acacia gum in varying amounts, resulting in watercolor paint. Water acts as a vehicle or a diluent to thin the watercolor paint and helps to transfer the paint to a surface such as paper. When all moisture evaporates, the acacia gum typically does not bind the pigment to the paper surface, but is totally absorbed by deeper layers. If little water is used, after evaporation the acacia gum functions as a true binder in a paint film, increasing luminosity and helping prevent the colors from lightening. Gum arabic allows more subtle control over washes, because it facilitates the dispersion of the pigment particles. In addition, acacia gum slows evaporation of water, giving slightly longer working time. The addition of a little gum arabic to watercolor pigment and water allows for easier lifting of pigment from paper and thus can be a useful tool when lifting out color when painting in watercolor. Gum arabic has a long history as additives to ceramic glazes. It acts as a binder, helping the glaze adhere to the clay before it is fired, thereby minimising damage by handling during the manufacture of the piece. As a secondary effect, it also acts as a deflocculant, increasing the fluidity of the glaze mixture but also making it more likely to sediment out into a hard cake if not used for a while. The gum is normally made up into a solution in hot water (typically 10–25 g/litre), and then added to the glaze solution after any ball milling in concentrations from 0.02% to 3% of gum arabic to the dry weight of the glaze. On firing, the gum burns out at a low temperature, leaving no residues in the glaze. More recently, particularly in commercial manufacturing, gum arabic is often replaced by more refined and consistent alternatives, such as carboxymethyl cellulose (CMC). The historical photography process of gum bichromate photography uses gum arabic mixed with ammonium or potassium dichromate and pigment to create a coloured photographic emulsion that becomes relatively insoluble in water upon exposure to ultraviolet light. In the final print, the acacia gum permanently binds the pigments onto the paper. Gum arabic is also used to protect and etch an image in lithographic processes, both from traditional stones and aluminum plates. In lithography, gum by itself may be used to etch very light tones, such as those made with a number five crayon. Phosphoric, nitric or tannic acid is added in varying concentrations to the acacia gum to etch the darker tones up to dark blacks. The etching process creates a gum adsorb layer within the matrix that attracts water, ensuring that the oil based ink does not stick to those areas. Gum is also essential to what is sometimes called paper lithography, printing from an image created by a laser printer or photocopier. Gum arabic is also used as a water-soluble binder in fireworks composition. Arabinogalactan is a biopolymer consisting of arabinose and galactose monosaccharides. It is a major component of many plant gums, including gum arabic. 8-5' non cyclic diferulic acid has been identified as covalently linked to carbohydrate moieties of the arabinogalactan-protein fraction. While gum arabic has been harvested in Arabia, Sudan, and West Asia since antiquity, sub-Saharan acacia gum has a long history as a prized export. The gum exported came from the band of acacia trees that once covered much of the Sahel region: the southern littoral of the Sahara Desert that runs from the Atlantic to the Red Sea. Today, the main populations of gum-producing Acacia species are harvested in Mauritania, Senegal, Mali, Burkina Faso, Niger, Nigeria, Chad, Cameroon, Sudan, Eritrea, Somalia, Ethiopia, Kenya, and Tanzania. Acacia senegal is tapped for gum by cutting holes in the bark, from which a product called kordofan or Senegal gum is exuded. Seyal gum, from Acacia seyal, the species more prevalent in East Africa, is collected from naturally occurring exudations on the bark. Traditionally harvested by seminomadic desert pastoralists in the course of their transhumance cycle, acacia gum remains a main export of several African nations, including Mauritania, Niger, Chad, and Sudan. The hardened exudations are collected in the middle of the rainy season (harvesting usually begins in July), and exported at the start of the dry season (November). Total world gum arabic exports are today (2008) estimated at 60,000 tonnes, having recovered from 1987–1989 and 2003–2005 crises caused by the destruction of trees by the desert locust. Sudan, Chad, and Nigeria, which in 2007 together produced 95% of world exports, have been in discussions to create a producers' cartel. In 1445, Prince Henry the Navigator set up a trading post on Arguin Island (off the coast of modern Mauritania), which acquired acacia gum and slaves for Portugal. With the merger of the Portuguese and Spanish crowns in 1580, the Spaniards became the dominant influence along the coast. In 1638, however, they were replaced by the Dutch, who were the first to begin exploiting the acacia gum trade. Produced by the acacia trees of Trarza and Brakna, and used in textile pattern printing, this acacia gum was considered superior to that previously obtained in Arabia. By 1678, the French had driven out the Dutch and established a permanent settlement at Saint Louis at the mouth of the Senegal River, where the French Company of the Senegal River (Compagnie Française du Sénégal) had been trading for more than fifty years. For much of the 19th century, gum arabic was the major export from French and British trading colonies in modern Senegal and Mauritania. France in particular first came into conflict with inland African states over the supply of the commodity, providing an early spur for the conquest of French West Africa. As the Atlantic slave trade weakened in the early 19th century, The Emirate of Trarza and its neighbors, in what is today southern Mauritania, collected taxes on trade, especially gum arabic, which the French were purchasing in ever-increasing quantities for its use in industrial fabric production. 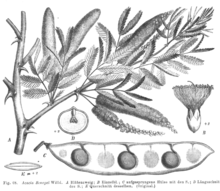 West Africa had become the sole supplier of world acacia gum by the 18th century, and its export at the French colony of Saint-Louis doubled in the decade of 1830 alone. Taxes, and a threat to bypass Saint-Louis by sending gum to the British traders at Portendick, eventually brought the Emirate of Trarza into direct conflict with the French. In the 1820s, the French launched the Franco-Trarzan War of 1825. The new emir, Muhammad al Habib, had signed an agreement with the Waalo Kingdom, directly to the south of the river. In return for an end to raids in Waalo territory, the Emir took the heiress of Waalo as a bride. The prospect that Trarza might inherit control of both banks of the Senegal struck at the security of French traders, and the French responded by sending a large expeditionary force that crushed Muhammad's army. The war incited the French to expand to the north of the Senegal River for the first time, heralding French direct involvement in the interior of West Africa. Africa continued to export gum arabic in large quantities—from the Sahel areas of French West Africa (modern Senegal, Mauritania, Mali, Burkina Faso, and Niger) and French Equatorial Africa (modern Chad) until these nations gained their independence in 1959–61. Although from the 1950s to the early 1990s, Sudan accounted for roughly 80% of gum arabic production, today, that figure is under 50%. However, hundreds of thousands of Sudanese are dependent on gum arabic for their livelihoods and it is still the world's largest single producer. The production of gum arabic is heavily controlled by the Sudanese government. Gum arabic slows the rate of absorption of some drugs, including amoxycillin, from the gut. ^ a b c d Mortensen, Alicja; Aguilar, Fernando; Crebelli, Riccardo; Di Domenico, Alessandro; Frutos, Maria Jose; Galtier, Pierre; Gott, David; Gundert‐Remy, Ursula; Lambré, Claude; Leblanc, Jean‐Charles; Lindtner, Oliver; Moldeus, Peter; Mosesso, Pasquale; Oskarsson, Agneta; Parent‐Massin, Dominique; Stankovic, Ivan; Waalkens‐Berendsen, Ine; Woutersen, Rudolf Antonius; Wright, Matthew; Younes, Maged; Brimer, Leon; Christodoulidou, Anna; Lodi, Federica; Tard, Alexandra; Dusemund, Birgit (2017). "Re‐evaluation of acacia gum (E 414) as a food additive". EFSA Journal. 15 (4). doi:10.2903/j.efsa.2017.4741. ISSN 1831-4732. ^ "Acacia senegal (gum arabic)". Royal Botanic Gardens, Kew. Archived from the original on 28 February 2018. ^ "Production and marketing of gum arabic" (PDF). Nairobi, Kenya: Network for Natural Gums and Resins in Africa (NGARA). 2004. Archived (PDF) from the original on 11 March 2016. ^ Smolinske, Susan C. (1992). Handbook of Food, Drug, and Cosmetic Excipients. p. 7. ISBN 0-8493-3585-X. ^ Vivas N; Vivas de Gaulejac N; Nonier M.F; Nedjma M (2001). "Effect of gum arabic on wine astringency and colloidal stability". Progres Agricole et Viticole (in French). 118 (8): 175–176. Archived from the original on 28 November 2011. ^ "Printing Process Explained". dynodan.com. Archived from the original on 15 August 2012. Retrieved 29 August 2012. ^ Laura Halpin Rinsky; Glenn Rinsky (2009). The Pastry Chef's Companion: A Comprehensive Resource Guide for the Baking and Pastry Professional. Chichester: John Wiley & Sons. pp. 1, 134. ISBN 0-470-00955-1. OCLC 173182689. ^ McEachran, Rich (16 August 2013). "Gum arabic: the invisible ingredient in soft drink supply chains". the Guardian. Archived from the original on 15 March 2018. Retrieved 29 April 2018. ^ Phillips, Glyn O. (1998). 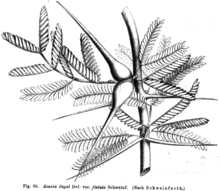 "Acacia gum (Gum Arabic): A nutritional fibre; metabolism and calorific value". Food Additives and Contaminants. 15 (3): 251–264. doi:10.1080/02652039809374639. ISSN 0265-203X. ^ Sarah Hills (17 November 2008). "Gum arabic caloric value lowered". foodnavigator-usa. Retrieved 6 June 2018. ^ Parmalee, Cullen W.; Harman, Cameron G. (1973). Ceramic Glazes (3rd ed.). Cahners Bookj. pp. 131–133, 145, 589. ISBN 0-8436-0609-6. ^ Azzaoui, Khalil; Hammouti, B; Lamhamdi, Abdellatif; Mejdoubi, El; Berrabah, M (2014-12-20). "The Gum Arabic in the southern region of Morocco". Moroccan Journal Of Chemistry. 3: 99–107. ^ Renard, D; Lavenant-Gourgeon, L; Ralet, MC; Sanchez, C (2006). "Acacia senegal gum: Continuum of molecular species differing by their protein to sugar ratio, molecular weight, and charges". Biomacromolecules. 7 (9): 2637–49. doi:10.1021/bm060145j. PMID 16961328. ^ ARGUIN Archived 27 June 2008 at the Wayback Machine, Encyclopædia Britannica (1911). ^ Webb, James L. A. (2009). "The Trade in Gum Arabic: Prelude to French Conquest in Senegal". The Journal of African History. 26 (2–3): 149. doi:10.1017/S0021853700036914. JSTOR 181721. ^ Policy Note, Export Marketing of acacia gum from Sudan Archived 10 September 2008 at the Wayback Machine. World Bank (March 2007), p. 4. ^ Gerstenzang, James; Sanders, Edmund (30 May 2007). "Impact of Bush's Sudan sanctions doubted". Los Angeles Times. Archived from the original on 1 June 2007. Retrieved 1 June 2007. ^ Eltayeb, IB; Awad, AI; Elderbi, MA; Shadad, SA (August 2004). "Effect of gum arabic on the absorption of a single oral dose of amoxicillin in healthy Sudanese volunteers". The Journal of Antimicrobial Chemotherapy. 54 (2): 577–8. doi:10.1093/jac/dkh372. PMID 15269196. Wikimedia Commons has media related to Gum arabic.